Obituary – Beasley, Ellis John « Perry High School Alumni Association, Inc.
– 17 years of age, attended grade school at Barnett, district 81, and four years of high school in this city. He is the son of John Beasley, route three, Perry, and was born in this county. He was vice-president of the Future Farmers of America chapter one year and a president another. Ellis will contribute to the national war effort by turning to farming after his graduation. Ellis John Beasley, 86, of Perry, Oklahoma, was the son of John H. and Bertha C. Swisher Beasley. He was born on September 26, 1925 in Perry, Oklahoma and died Friday, May 4, 2012 at Midwest City Regional Hospital, Midwest City, Oklahoma. He graduated from Perry High School 1943. He married Marilyn J. Patch, August 4, 1945 in Perry, Oklahoma and she preceded him in death June 2, 1993. Ellis then married Betty Jean Smith, on May 7, 1998 in Oklahoma City and she preceded him in death on August 5, 2011. Ellis enjoyed fishing, hunting and camping, but most of all spending time with his family. In 1945 he won the FFA State Farmer Rancher of the Year. He owned and operated a diesel truck service business in Perry. He loved to attend high school and college wrestling matches. Ellis attended sixty-six consecutive NCAA National Wrestling Tournaments. Ellis was a member of the Perry Lions Club, the Perry Elks Lodge, the Perry School Alumni Association and the Perry Wrestling Foundation. Funeral services will be 2:00 p.m., Wednesday, May 9, 2012 at the First Baptist Church, Perry, Oklahoma. Brother Aaron Summers will officiate. Interment will be St. Rose of Lima Catholic Cemetery, Perry, Oklahoma. Services are under the direction of BrownDugger Funeral Home. Family will receive friends from 6:00 p.m. to 8:00 p.m., Tuesday, May 8, 2012 at BrownDugger Funeral Home in Perry, Oklahoma. 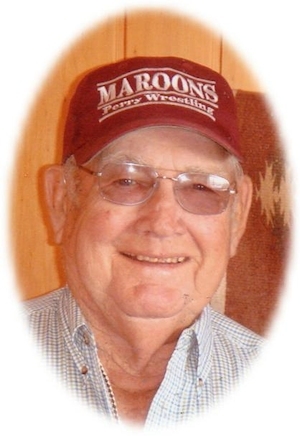 Memorials may be made to Perry Wrestling Foundation in care of BrownDugger Funeral Home, 1010 N. 7th Street, Perry, Oklahoma 73077. Ellis is survived by two sons, Ellison Jon Beasley and his wife Karen of Stillwater, Oklahoma, Dan Lynn Beasley and his wife Karen of Perry, Oklahoma one daughter, Janene Yvonne Bridwell of Midwest City, Oklahoma five grandchildren, Kimberly Ann Jackson of Edmond, Oklahoma, Kristen Lynn Beasley of Dallas, Texas, Suzanne Lynette Bridgeman and Jalynn Rose Hoggatt both of Midwest City, Oklahoma, Cody John Beasley of Perry, Oklahoma seven greatgrandchildren, Janelle Nicole Hoggatt, Hope Annette Bridgeman and Mason Ellis Bridgeman all of Midwest City, Oklahoma, Colby Jon Jackson and Cadyn Carey Jackson both of Edmond, Oklahoma, Savanna Kinsey Beasley and Triep James Beasley both of Perry, Oklahoma one sister-in-law, Barbara VanCoevering of Collinston, Louisiana. He was preceded in death by his parents, John H. and Bertha C. Beasley wife, Marilynn Jane Beasley wife, Betty Jean Smith Beasley, granddaughter, Misty Rae Beasley and son-in-law Ray Bridwell.